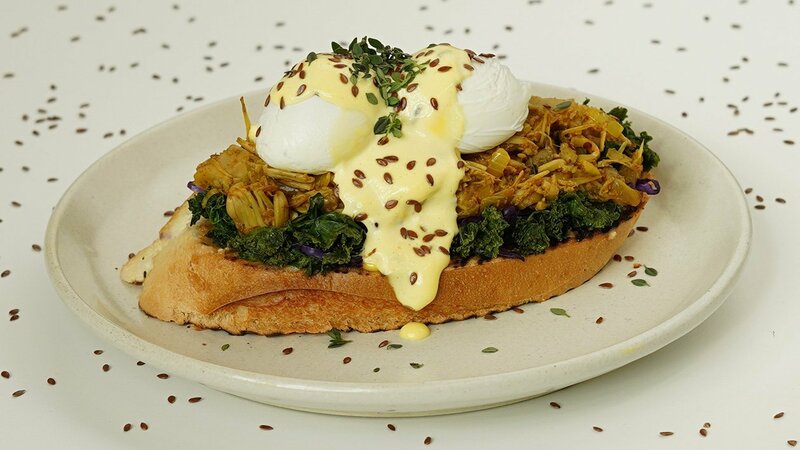 Let this trendy jackfruit twist on the classic benny, paired with a wickedly creamy hollandaise, tantalise your tastebuds in every way. In a large frying pan, sauté the onions with a little olive oil. Once soft, add in the mushrooms and jackfruit. Cook until slightly coloured, then add in KNORR Korma Paste and fry. Add 1 litre of water into the pan and simmer for 35 minutes, stirring occasionally. Top up the water, if needed. Once the jackfruit is soft, use tongs or potato masher to shred the pieces until it resembles the texture of pulled meat. Leave the mix a little wet and set aside. In a food processor, blitz the cashews with 40g of coconut oil until it reaches a buttery consistency. Whisk together the 75ml of hot water and Knorr Coconut Milk Powder. In a small pot, combine the coconut milk mix with Knorr Hollandaise Sauce and heat on low, stirring frequently. Fill a pot with 2 litres of water, add the white vinegar and bring to boil. Poach eggs. Sauté the kale, red cabbage, carrots and snow peas with 25g of coconut oil, salt and pepper. Toast a slice of sourdough, then spread with cashew butter. Top with sautéed veg, pulled jackfruit and poached egg. Drizzle with coconut hollandaise.